I began 2015 with the first post in my “Why Phoenixville?” series. I phrased it as a question—in fact THE question for historians—because I do not know the answer, nor do I know anybody who does. That answer (or, more likely, answers) would be of great value to the other towns along the lower Schuylkill at the very least, and probably many more than that. It’s a subject well worth pursuing, and I shall continue. I put the question out for discussion and contributions among my readers, and have been continuously pleased with the results. I printed a full post by a guest a few weeks ago, and this week I want to take up some of the subjects offered by others in their responses. Several actually compiled lists, with points that deserve to be made. This week I touch on just a few. This statement is manifestly true, and several people commented about how active their churches are in the community. Yet I have some questions about determining how religious a community is, even using the obvious data. Take the situation in Bridgeport, for example. The borough possesses about one quarter of the population of Phoenixville, and their economic conditions can scarcely be compared. The final two Catholic churches within the borough’s boundaries have just shut down, leaving Bridgeport without a Catholic place of worship for the first time since 1892. Does that make Bridgeport any less religious that Phoenixville? I seriously doubt that. These closures are about people and money, or rather the declining number of both, not the religious nature of those that remain. Perhaps the point raised by another writer applies here: “The Borough's size seems just right; not so big that doing things is like trying to turn the Titanic, but big enough to actually have some resources.﻿” I’m not so sure that any size is “just right,” but smallness is usually more of an impediment that largeness. I think Bridgeport falls into that category. My second question about the place of religion in the revival of Phoenixville is one of the favorites of historians, referred to generically as the “chicken-or-the-egg question.” Is Phoenixville’’s religious/community orientation a cause of the borough’s revival, or a result? In other words, did Phoenixville’s already religious nature attract people who wanted to live in a close-knit community, thus spearheading its revival, or did its revival, locally-generated as it has been, attract this kind of people? The answer to such a question is usually “both,” because any individual component in so complex an equation can be both a stimulant to and a result of a town’s revival, particularly when it involves judging the nature of a substantial portion of the population. Because we must employ those arbitrary and imaginary categories that I have written about previously, the question becomes at which end of the spectrum does this particular component, on balance, deserve to be placed, as cause or result? I’d like to hear more about this aspect of the subject from you, my readers. It’s important. Other readers have made individual points that must remain classified as claims rather than facts, because they are not manifestly obvious. Two of these are subjects so vitally important to a town’s revival that—and with all due respect to their author(s)—they must remain as theses, not conclusions. Each might be correct or it might not, which is just the kind of search in which I love to participate. These two date back to my first post, and I regret having to wait this long to air their heartening opinions. One writer put the spotlight on the borough’s administrative staff. This is a hugely important aspect of a community's revival, and the claim made is that the staff of Phoenixville Borough has been quite supportive of private efforts in recent years. The writer specifically praised the (now-defunct) Community Development Corporation for its efforts. This opens an interesting issue (why is it defunct? Was it no longer needed? ), about which I look forward to reading opinions. The first, if true, is laudatory. The second, if true, would be a miracle. I hope that the historical record demonstrates that both are, but that would make them exceptions to the norm. I very much want to hear other opinions on the subjects of borough administration, its relationship with the county, and the attitude of surrounding residents toward what has happened to Phoenixville. These are crucial subjects, and because they involve several sub-topics and even more people, the answers are likely to be complex. Let me hear from you. I advocate for communities. I am pretty open as to just what can be called a “community,” and put people above profit. As such, I am no great fan of Bigness, particularly when it comes to corporations. I am by nature on the side of “the little guy.” But I live in the real world, and much has changed since I reached adulthood. Today, in order to be a writer, I must abandon my principles and publish (indirectly) using one of the best examples of how Bigness can work against those communities for which I work. Here’s the sad but logical story, and a very principled one. The Bigness I refer to is Amazon.com, which I have been known to refer to as “Amasquash,” for the effect it has had on one of my favorite components of a community, the local, independent book store. I cannot place the blame for the almost complete demise of local book stores solely on Amazon, as the Bigness Effect on them goes back to increasingly larger brick-and-mortar stores, which climaxed with Barnes & Noble and the late, unlamented (at least by me) Borders. But Borders is gone, and the future of Barnes & Noble is obscure at best, because online ordering has replaced going to the local—or even not so local—bookstore. Local bookstores are by no means the only victims of Amasquash, but they have meant a great deal to me since childhood, and are the ones with which I, as a writer, am most concerned. A community needs a means of communication among its members. Not too long ago, a bookstore was a likely candidate for the job. It attracts people who like to think and talk, and among them a few who also like to do something. Talk about yearning for a lost world, but it is exactly that type of local communication that a thriving community demonstrates. Today’s technology delivers personal isolation, which is a cancer on any sense of community. In the kind of irony that one finds everywhere in history, technology has enabled an unprecedented widening of those with something to contribute, so that a community need not depend solely upon itself for ideas and support. Knowledge from far away and previously unavailable is today quite literally at our fingertips. The problem is getting the fingertips in touch with each other. 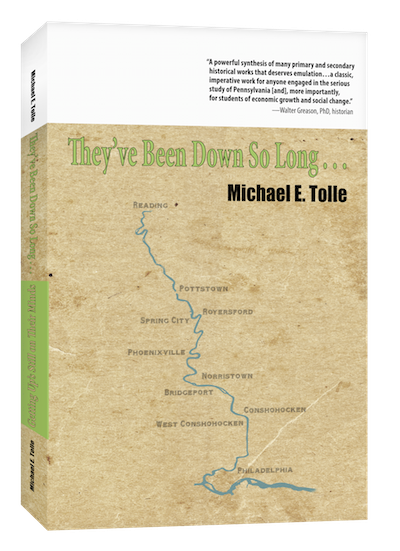 I have just published a book entitled They've Been Down So Long.../Getting Up's Still On Their Minds, which is aimed directly at the residents of the eight towns on the lower Schuylkill River. They are my primary market, but after the problem of making them aware of the book (and it’s a big problem) comes the question of where they can buy it. Online purchase easy; the book is only a few keystrokes away (I will provide the link at the end of this post). Nothing should be easier, but I am old enough to know better, personally as well as academically. The fact that “It’s just not the same” I can attribute to age and personal experience, but I also assess the online phenomenon professionally as a major historical event. There is not only single independent bookstore in the eight towns that constitute both my subjects and the core of my market. There is, however, one that is at least strategically located near several of them, the Towne Book Center and Café, in the Providence Town Center at the intersection of U.S. Route 422 and Pa. Route 29. This shopping center is an ersatz location if there ever was one, an artificial “re-creation” of the mythical American downtown of our dreams. But it does have an independent bookstore, and I sold a good number of copies of my first book there. 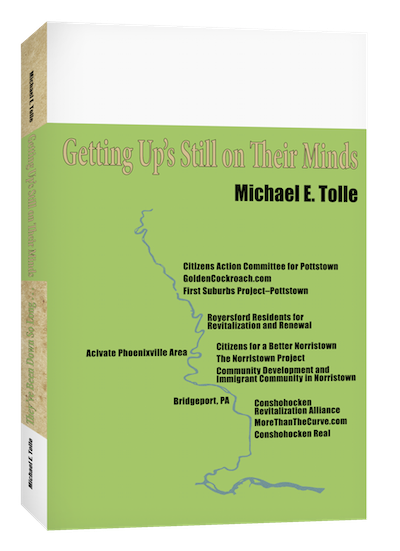 I had hopes for even greater sales, as the subject of my first book was only Norristown, while my second, They’ve Been Down So Long…/Getting Up’s Still On Their Minds, deals with an additional seven towns. I was therefore displeased to be informed by the store owner that he will not stock my new book. He’ll fulfill any orders placed, but will not stock it. He has a reason, a very principled one. Amazon is his enemy, and he is part of an organization fighting it in the courts. Things are getting ugly, and he is angry. Therefore, because my book is published by a company owned by Amazon, he says sorry but no. He is clearly taking this stand on principle. Amazon is simply not going to notice—much less care—that one bookstore has declined to stock my new book. His business, on the contrary, will lose potential income. The loss may not be too noticeable, but it is certainly a greater percentage of his gross sales than of Amazon’s. I lose the most, largely because “brick and mortar” book outlets are getting quite scarce (At present I have only one, the Historical Society of Montgomery County, at 1654 DeKalb Street in Norristown. 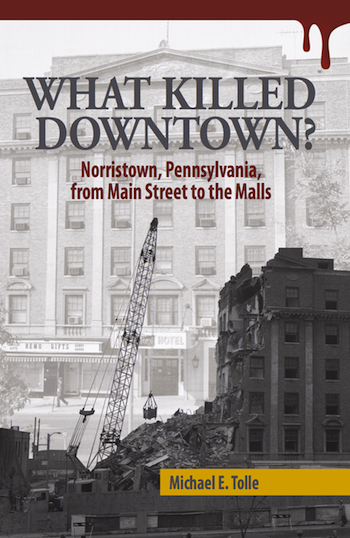 The Spring-Ford Area Historical Society will be stocking copies shortly). Thus the loss of even one hurts. I am deeply conflicted on this. I truly believe that people in the towns not too far from the Towne Book Center could benefit from reading my book. That’s why I wrote it. To have my best (okay, only) local bookstore refuse to stock my book certainly doesn’t help what I am trying to do. Yet I am also sympathetic, for reasons explained above. I write about principles I consider important and Towne Book Center upholds a principle it considers important, in the knowledge that the gesture will go entirely unnoticed. We both uphold our principles, and make no impact whatsoever on the Bigness we both oppose. Here again, on a day-to-day basis (but not “in the end”), it truly is all about the Benjamins. We can all lament this to our heart’s content, but we have to keep on living in this changing world, and that means compromise. The struggle over principles is unending.